"Can two people of different social standings find a holiday love worth fighting for?" Regina is approaching her thirtieth birthday and wants nothing more than to take some control over her life before being forced to marry a man she does not love. She decides to lose her virginity to the handsome Daffin Oakleaf, who she so easily connected with a few months prior, is the perfect birthday gift. The only problem is he's a Bow Street Runner and beneath her in social standing, so if anyone found out it would lead to disaster. However, when someone starts to threaten Regina's life, Daffin steps in to protect her and their previous spark reignites. Can Regina and Daffin overcome their social classes to find true love over the Christmas holiday? KISS ME AT CHRISTMAS is another installment in Valerie Bowman's Playful Brides series. Previous readers of the series will be happy to learn that Bowman has made sure to include other characters from previous stories, but will also be quite pleased with the heroine and hero of KISS ME AT CHRISTMAS. Regina is a wonderful heroine. Older than most romance heroines, she has some maturity due to her age, and her independent nature and loyalty to family are great traits. Her vulnerabilities and mistakes make her a very human character, and readers will easily be able to relate to her. Daffin has easily become one of my favorite heroes from Bowman's novels, and intelligence, determination, and loyalty are easy to see. I like that Bowman puts together two characters from different social classes, and their struggle is believable. The Christmas backdrop adds some magic to the story, and the romance is tender and sensual. There are some great action scenes in KISS ME AT CHRISTMAS and a couple of plot twists will take readers by surprise, and keep them on their toes. 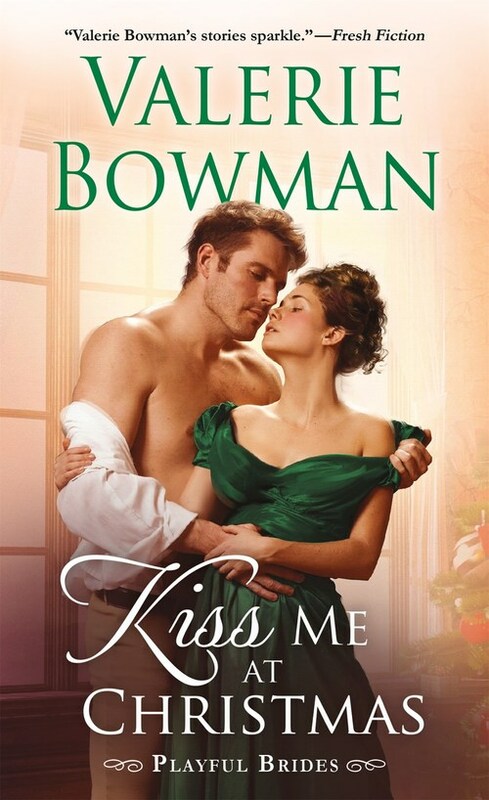 KISS ME AT CHRISTMAS has easily become one of my favorite books by Bowman, and romance readers will not want to miss this holiday romance. The Christmas season has hit Regency London in the next installment in the Playful Brides series! It�s the Christmas season, and the Playful Brides series embraces holiday cheer, and forbidden love, with a dash of mystery! The aristocrats in Regency London are shaken by a series of crimes plaguing them during the holiday season. The chill in the air isn�t just from the first hints of snow, and the Christmas spirit hasn�t hit society. Daffin Oakleaf, a Bow Street Runner, one of London�s first official police force, is on the case, but realizes he needs some assistance questioning members of London high society to solve the crimes. When he enlists help from the granddaughter of a duke, the lovely Lady Regina, sparks soon burn between them, despite their class differences. But could a romance between them ever work? This next Playful Brides installment from Valerie Bowman is sweet, heartwarming, and filled with exciting action and sweeping romance that she does best! Re: Can two people of different social standings find a holiday love worth fighting for? Great review! I just ordered it!